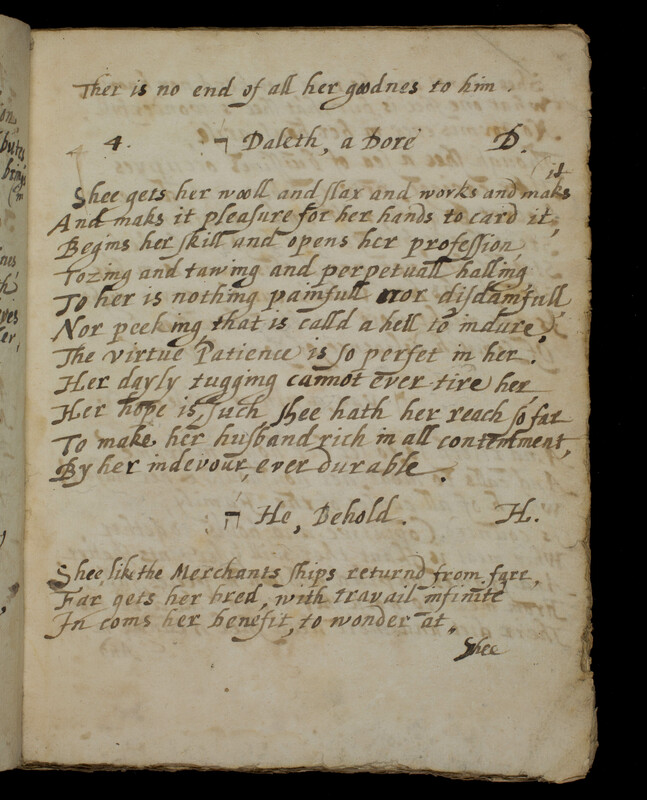 Access: The Medieval and Early Modern Manuscripts Collection is open for research use. Researchers are advised to contact the Rare Books Special Collections & Preservation Department prior to visiting. Upon arrival, researchers will also be asked to fill out a registration form and provide photo identification. Restrictions on use and copyright information: In consultation with a curator, reproductions may be made upon request. Permission to publish materials from the collection must be requested from a curator. Researchers are responsible for determining any copyright questions. This collection was processed by John Chandler in 2013. Finding aid written by John Chandler in 2013. 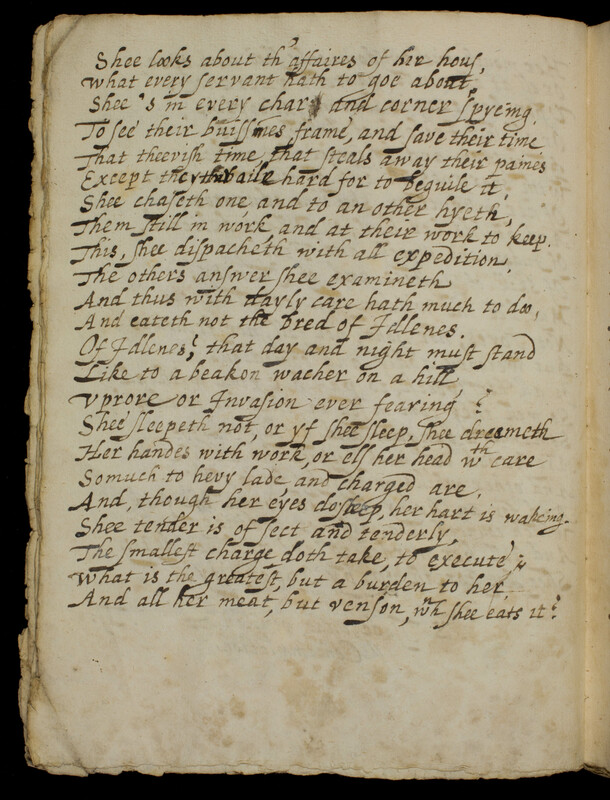 (Name of item, if applicable), Collection Title, Date Span, Rare Books Special Collections & Preservation Department, University of Rochester. 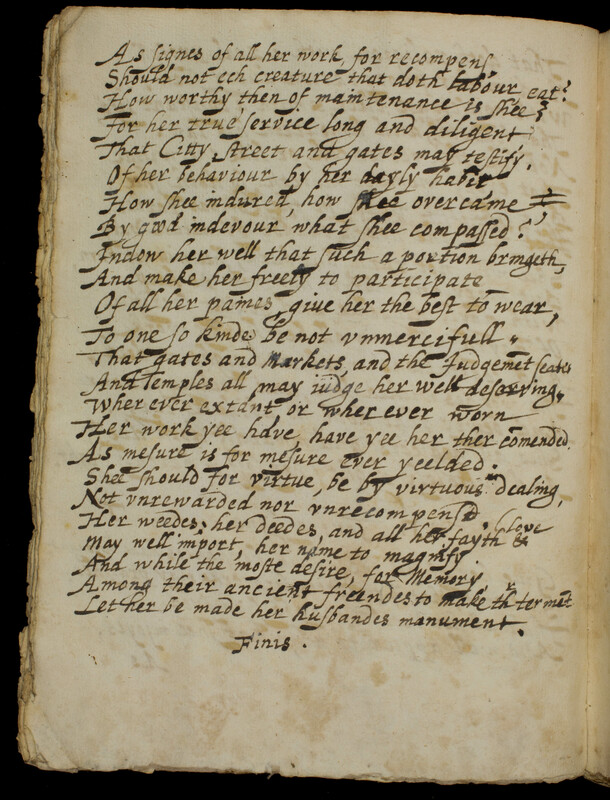 The Medieval and Early Modern Manuscripts Collection includes documents that date from 800-1700 A.D. Signature pieces in the collection include the inventory of the library of the monastery of St. Victor de Marseille from 1374 A.D. and the Italian Documents collection donated by University of Rochester Professor Abraham Karp. The collection includes individual leaves, as well as complete works. The bibliographic information listed below includes the item's call number and name, language, date, origin, contents and provenance, when known. If the item has no common or given title, the first line or phrase of the document serves as the title. When the date is a range, the assigned call number reflects the earliest likely date; in the case of undated items, the number 1000 has been assigned, but does not reflect an actual date of creation. Contents: Excerpts from the Psalms, this text often appears in Books of Hours. Contents: Rites for the reconciliation of penitents. Also known as the Gelesanium Sacramentary, this passage is part of section 602 in the edition by Patrick Saint-Roch. Contents: Collection of various passages from the New Testament. Contents: Deed exchanging part of a mill at Welna for a vineyard. 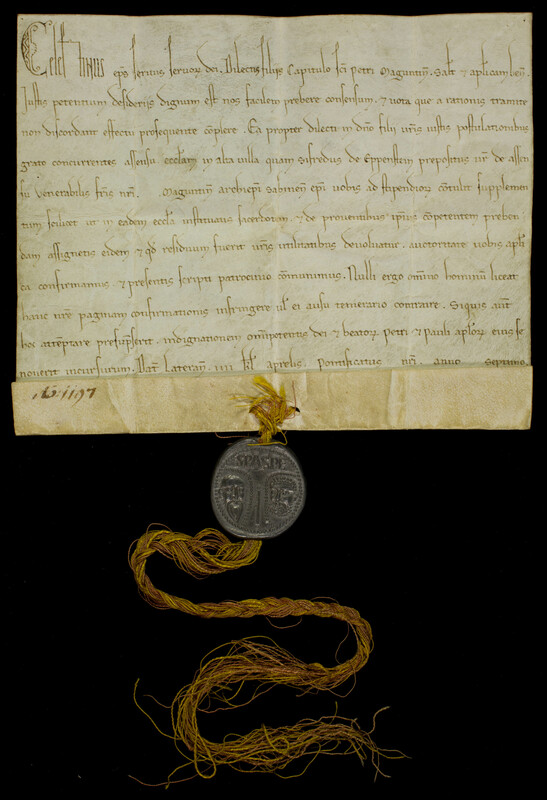 Contents: Papal bull confirming the union of the church at Altavilla to the chapter. Printed by Migne, Patrologiae Latina, vol. CCVI, col. 1207. Contents: End of Psalm 37 and beginning of Psalm 50. The two were often juxtaposed in a series of penitential prayers in books of hours. Contents: Six fragments taped to a piece of paper identified as “Court hand of various periods.” The first and second pieces are adjacent, identified as “Circa 15th c.,” and are from the same manuscript. The third fragment is “Circa 14th c.,” the fourth and fifth “13th c.?,” and the last “Could be 13th or 14th c.” Fragment 5 appears to have been a catchword. Contents: Will of John, son of Robert de Cruce. 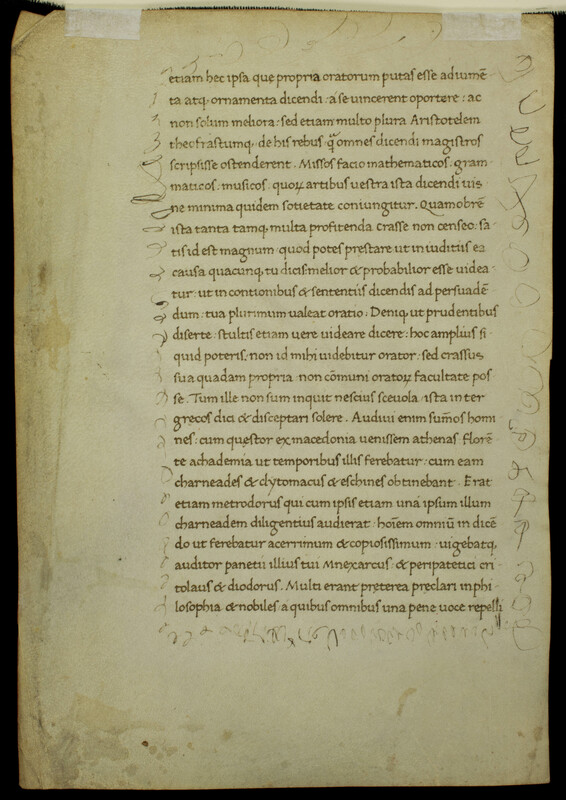 Contents: Deed and transfer of lands from Dulciana to Petrus Alcardus. Contents: Leaf with text of Habakkuk 3:9-19. Contents: Commentary on the virtues of patience and humility. Contents: Texts of Psalms 58, 59, and the beginning of 60. Contents: Deed for Wiswell, Lancashire. Written in Norman French, the document was signed in Whalley. Sir Thomas de Ardern gives the contents of the manor of Wiswell, in Lancashire, to Richard, son of William de Radeclif; to his brother, Adam de Radeclif; and to John of Gristwych, vicar of Blackburn. 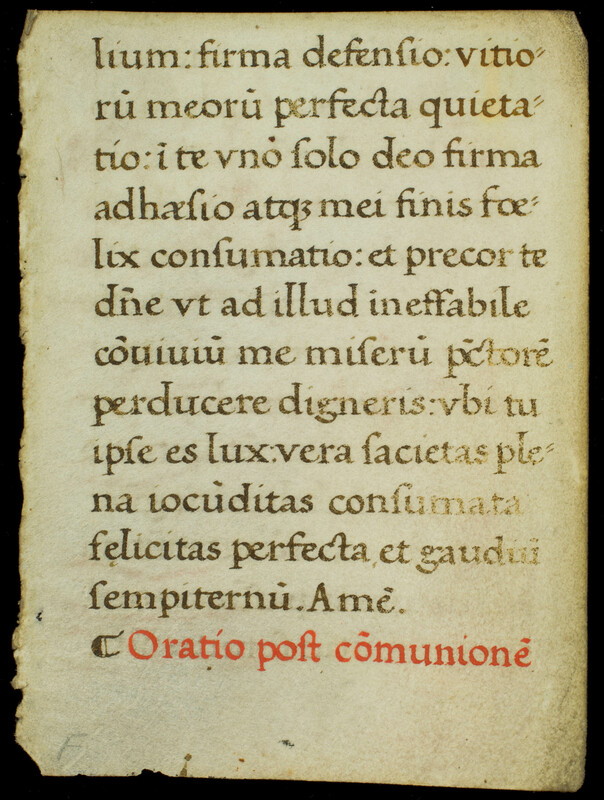 Contents: Fragment of prayers before and after communion. 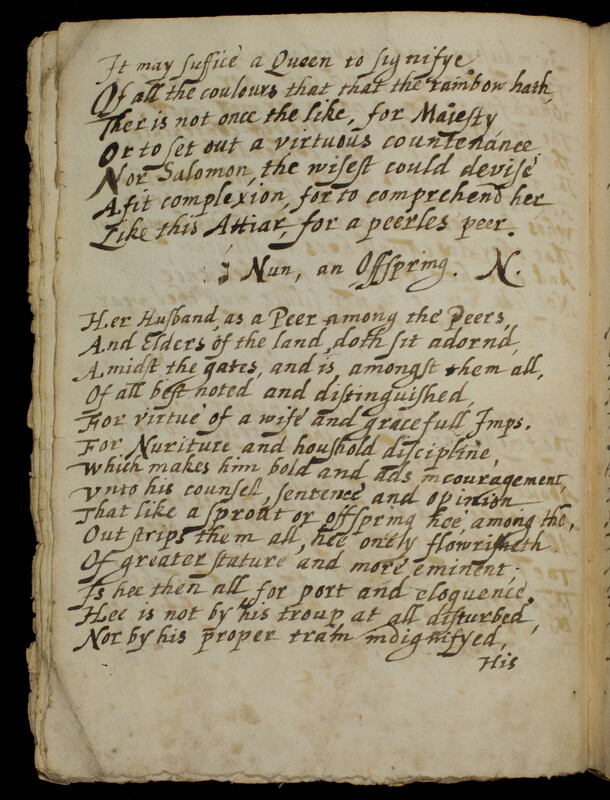 Contents: Leaf from Westminster use missal; this text is part of the mass for the dead. 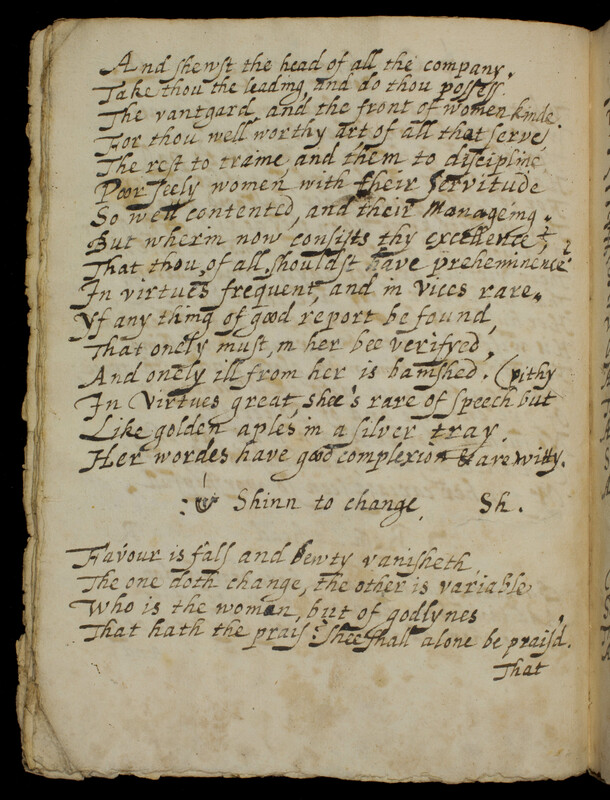 See the edition by Wickham, columns 1315-16. Contents: Portion of Paschasius Radbertus, De Assumptione Sanctae Mariae Virginis. 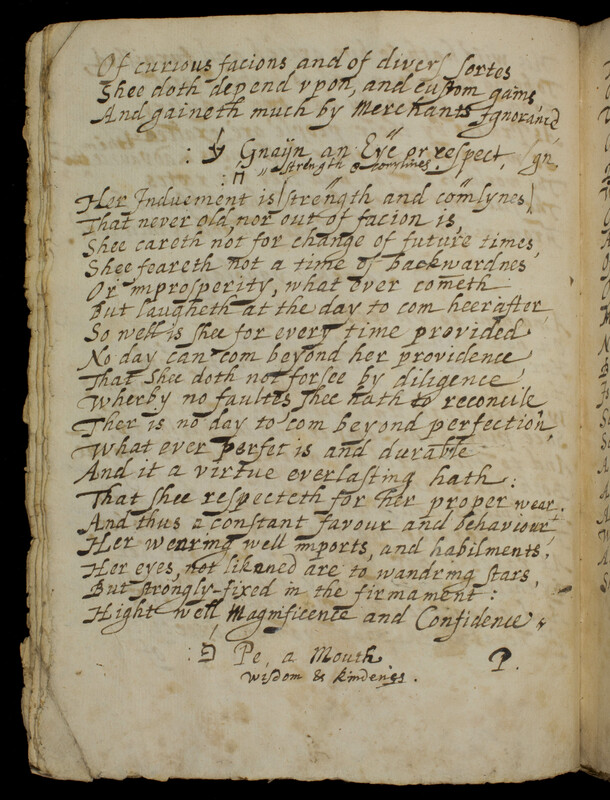 Contents: Prayers, including the end of the hymn "Quem terra, pontus, aethera." The hymn is number 59 in The Oxford Book of Medieval Latin Verse, ed. Raby (pp. 79-80). Contents: List of cases pending in the court. The cover is a larger, unidentified vellum document, rotated 90 degrees and cropped. Contents: Commercial document transferring money from Nicola to his son. Contents: Notice of loan from Carne to Thomas Cranmer, archbishop of Canterbury. Contents: Anti-Catholic theological diatribe signed by five Protestant pastors. Immediate Source of Acquisition: unknown; the manuscript was initially disbound and individual leaves sold by the Foliophiles. Contents: Signature. Dudley (1532/33-1588) was a favorite of Elizabeth I. He was made earl of Lancaster in 1564. 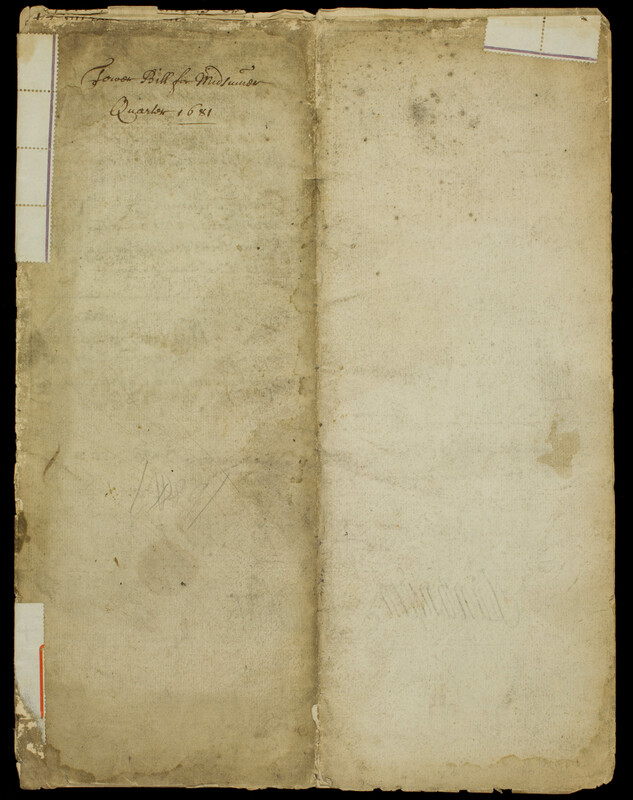 Contents: Document by Duprat, provost guard of Paris, concerning Charlotte d’Esquetot, widow of Charles I de Cosse-Brissac, marshal of France. Contents: Signature. 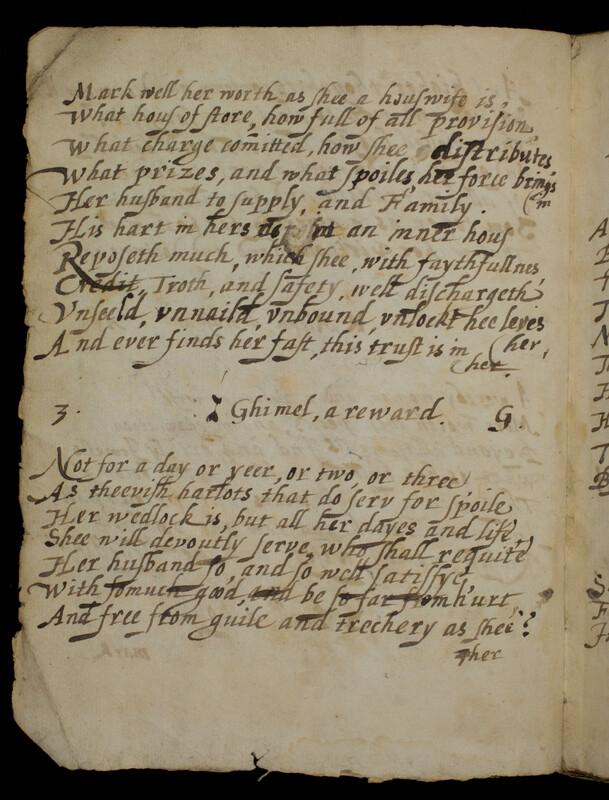 Goffe was a divine, poet, and playwright who lived 1591-1629; this signature is likely from the early seventeenth century. Contents: Political document signed by Gilles de Louvre, marshal of France and tutor of Louis XIII. 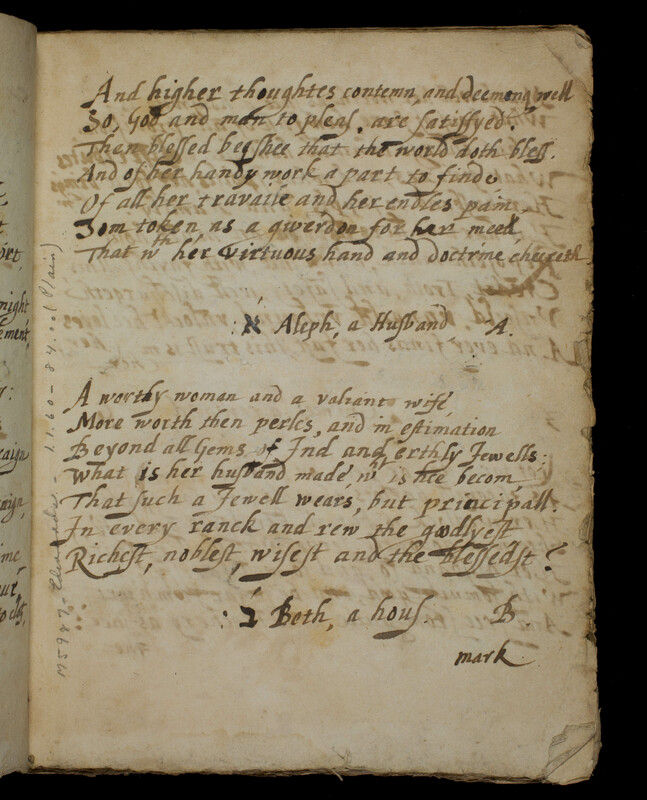 Contents: Copy of levy of soldiers in Buells under Elizabeth I. Contents: Political document. Folio 4r-v seems to be a second text, with a new header and notary signatures. Contents: Signature. 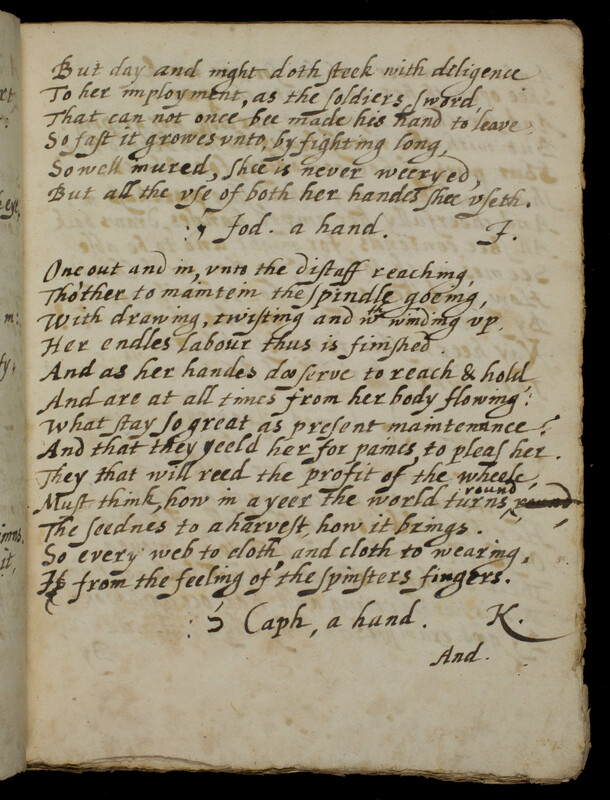 An eighteenth-century hand has identified Lilie as “author of severall plays.” No further identity has been confirmed. Contents: Copy of legal statement transferring property. Contents: Political document. The date on the cover is 1602, which seems to be when the agreement was proposed. The date at the end, just before the notary signature, is 1617, presumably when the document was written, witnessed, and registered. 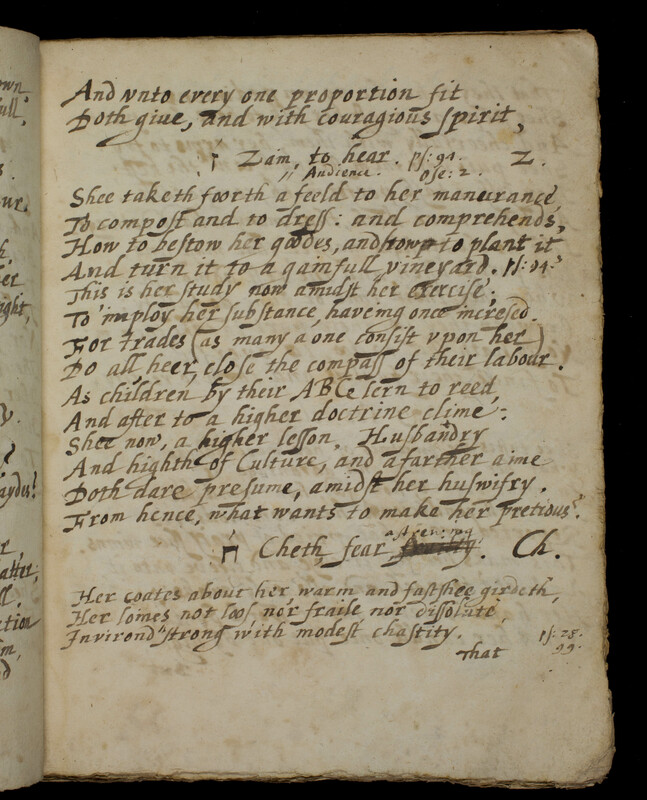 The assigned date, February 9, 1617, is inscribed inside the back cover. Contents: Religious meditations, possibly sermon notes. Contents: Fragment of political pamphlet. Contents: Signature. Twysden (1597-1672) was knighted in 1620. This signature, which may have been an ownership inscription, must date from after his knighthood was granted. Contents: Papal brief - Gregory XV to Elizabeth Fard. Contents: A collection of religious poems and sayings organized under the headers of Hebrew letters. Its full title is A Calender of Salomons Wife or Prognostication of a Virtuous Woman; Also Jerimyes Prognostication of Jerusalem’s overthrow by a secret Construction of the Hebrew Letters, for Propriety and Strange Resemblance, moste curious and elegant. The date appears at the end of the text. A short Hebrew text also appears after the last page of English text. Contents: Papal brief - plenary indulgence. Contents: Last will and testament of Hippoliti de Hippolitis. Contents: Letter to Jacob L. Loffler. Contents: John Powell asks Warwick to write a few lines for a friend. Warwick responds on the bottom of Powell’s letter. 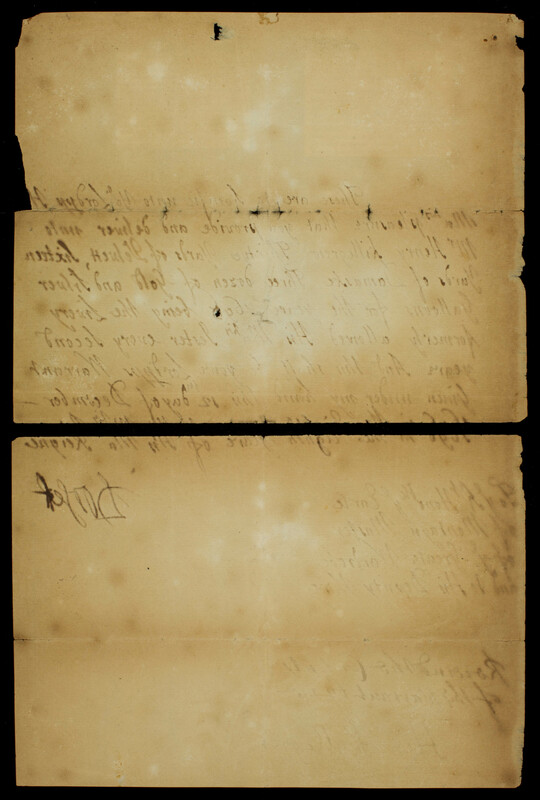 Contents: Letter to his uncle regarding conditions in the military camp during a siege. Contents: Account sheet. Dates range from 1499 to 1646; the date assigned here is the last one recorded. Contents: Letter to John Robertson, captain of Blair Castle, Blair Atholl, Scotland. Contents: Letter of support for the royal family. Percy’s sister and younger brother were members of the household of Henrietta Maria, Charles I’s queen, and she may be the “madam” Percy addresses herein. The queen and Charles II lived in exile in France following Charles I’s beheading (1649). This letter may be a reassurance that Percy will support them in England during their exile. He was a supporter of constitutional monarchy throughout his time in Parliament. Contents: Ordination permission for Thomas Maria Bosco. 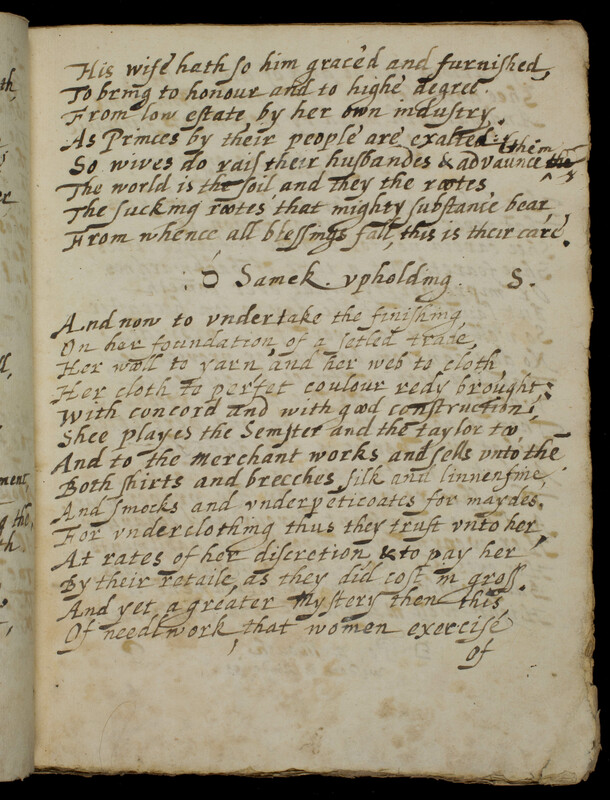 Contents: Notes for six sermons by unidentified author. Contents: Investiture of Henry Howe as vicar of Loudham. 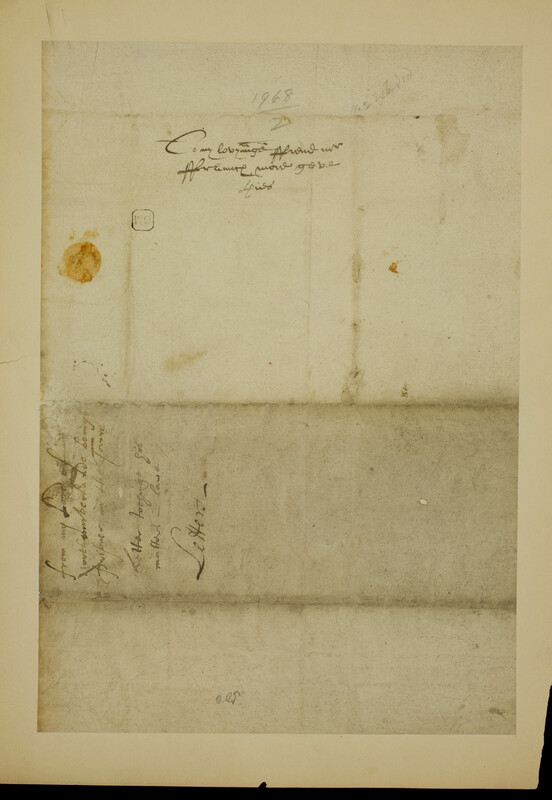 Contents: Letter to Henri II of Orleans, duke of Longueville. Contents: Note of payment due. Item Name: Rogers, John, Jr. Contents: Letter to Thomas Cole, his cousin. Contents: Inscription from a book given to Francis Bramston. Contents: Bill for holding “The Catholic Lords in the Tower” collected in the Titus Oates Plot (or Popish Plot) by Charles II in 1678. Document is folded in quarters, and has largely broken along folds. See also item D.460 1678-001. Contents: Signature. Ken (1637-1711) was an English cleric, known as one of the fathers of modern English hymnology. This fragment reads “Tho: Ken Bp.” Ken was the bishop of Bath and Wells from 1685 to 1691. 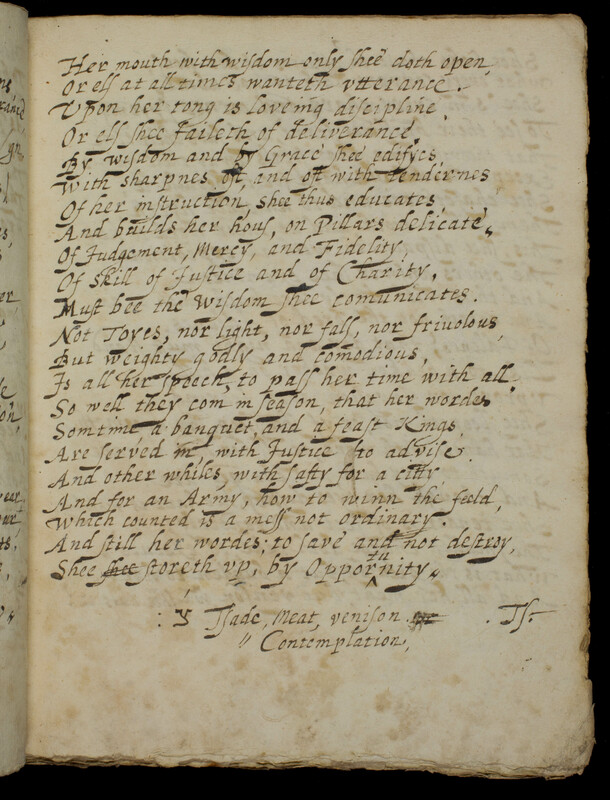 Contents: Apprenticeship of John Tante to Thomas Martine. 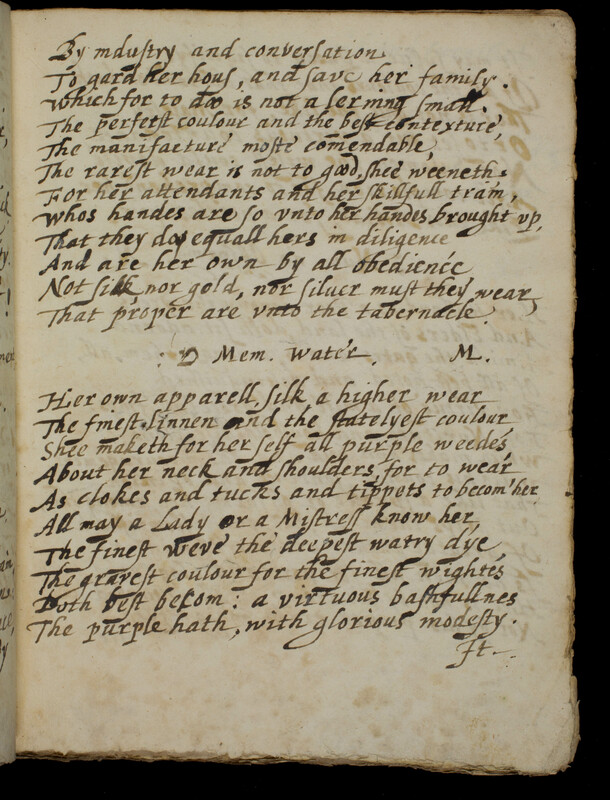 Though the core of this text is a printed document with spaces left for the details of the apprenticeship, there are significant handwritten additions describing the extent of the apprenticeship in the printed area itself, in the margins, and at the bottom. Contents: Transfer of land belonging to George Octave Goussart to Martin Goussart, his cousin, with Guerin Goussart acting for Martin, his brother, before the courts. Contents: Request for cloth and payment to be given to Henry Killegrew. While it is unclear if Dorset wrote the letter, he did sign it, as did Killgrew (in a very unsteady hand). The letter itself has torn in half along a fold line. Two brief biographies are pasted to the top of the letter. Contents: Oxenstiern expresses his pleasure at hearing that the Count de Greiscar will reside at the court in Stockholm. Origin: unknown Contents: Commentary on the appearance of the Holy Spirit as a dove. Contents: Leaf with text of Leviticus 14:15-16:11. 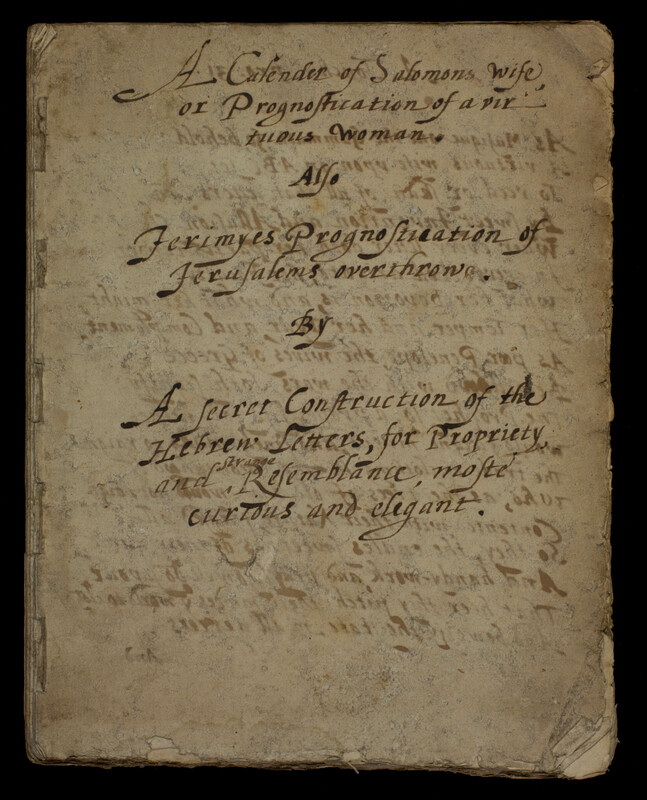 Contents: Simon de Cremona, "Sermones." Contents: At the request of John Field, the mayor of Calais and constables of the Staple certify payments by Sir John Michel to the Staple. Contents: Contemporary notarial copy of a document exchanging land adjacent to Leonardo’s property. Supporting materials include a book by Beltrami and a typewritten description. Contents: A note for 200 Sterling, borrowed from five men. The document has Latin on the obverse, English on the reverse. Contents: Commercial document. This is a fragment of a longer document, and the date has been assigned by a later hand. Contents: Obligation regarding indentures of bargain and sale. Contents: Letter to Nathaniel Bacon. Contents: Percy asks for legal counsel and laments his improper detainment. Contents: Letter to the Marquis d’Alarson. 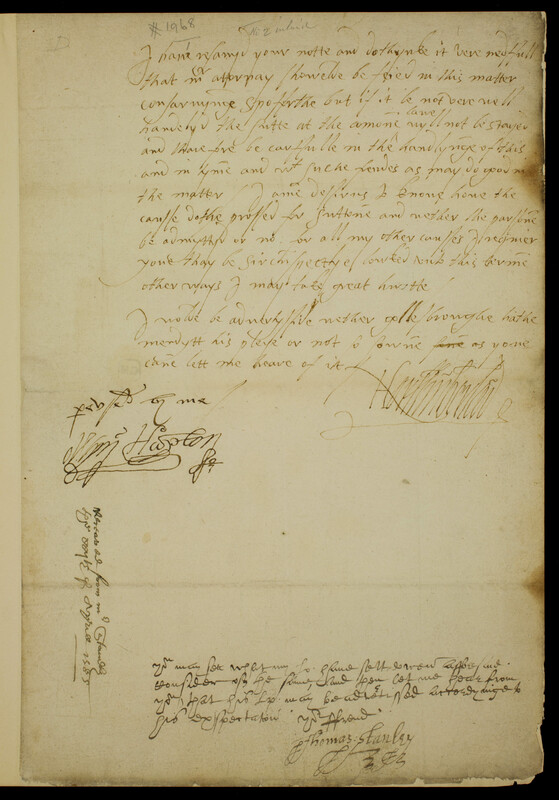 Contents: Document addressed to Lord Burghley, Lord High Treasurer to Elizabeth I, dealing with the shipment of wheat and other supplies to Ireland. Contents: Marie, queen of France, bestows chattels and estates on Anthoine de Louvencourt. Contents: Letter to Sir Henry Spelman. Contents: Four documents regarding the Spanish Match of Charles I. They seem to be copies of earlier documents, primarily a collection of letters and speeches. The originals date from 1622-23, and these appear to be contemporary copies. Contents: Cardinal Richelieu informs the notaries of the Châtelet that he has empowered Jehan Bouilliau to be his attorney in his county of La Chapelle-Bellouin. Bouilliau will act as his proxy in all questions of feudal homage owed by or to Richelieu in his position as count of La Chapelle. 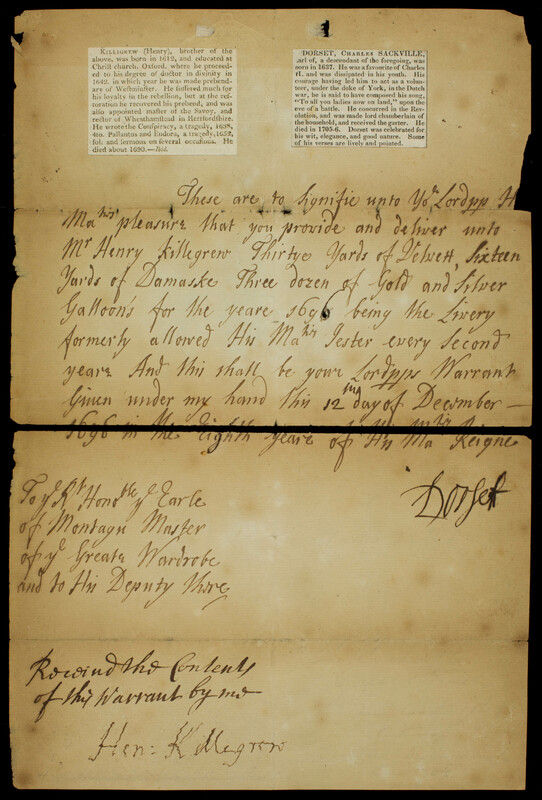 Contents: Copy of Charles II's decision in dispute regarding the College of Arms and the Earl Marshal of England. Contents: Letter to Sir Richard Bulstrode regarding passports. 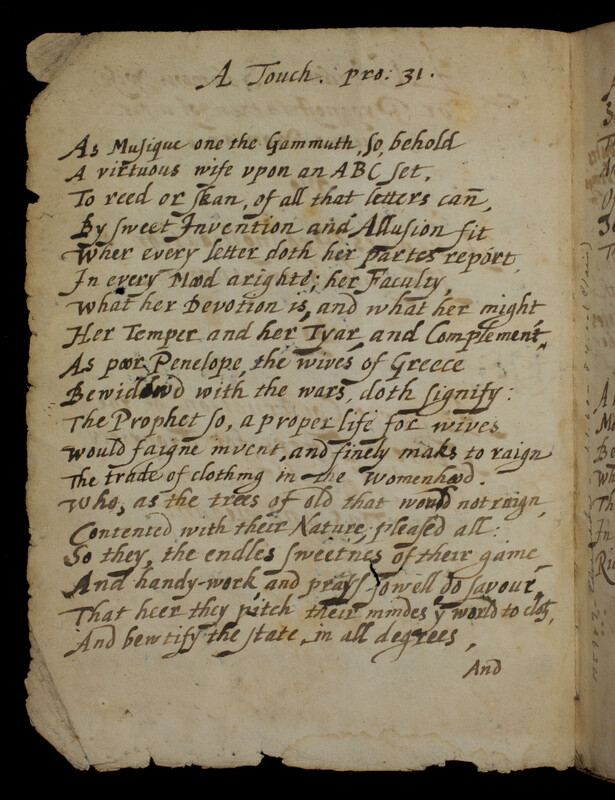 Contents: List of dates and documents Oates claimed would prove the Titus Oates Plot (or Popish Plot). See also item D.460 1681-001. Contents: Loosely bound collection of four documents. Southwell was asked to write a biography of the duke of Ormond, which he worked on from 1682-88. These documents appear to be notes regarding that biography, though the third records Ormond’s death in 1688, suggesting a later date for that document. Contents: Note to the Exchequer to pay Charles, earl of Middleton. Contents: Newton, acting in his role as Warden of the Mint, calls upon several witnesses to testify what they know about Elizabeth Brion, who is accused of hiding coining tools. Contents: Fuller asks his father to review the draft of a document regarding licensing physicians. Immediate Source of Acquisition: Donated by Michael Sze, 2015. Contents: Six strips of parchment from a single manuscript, preserved because of their later use as reinforcing bands in a bookbinding. 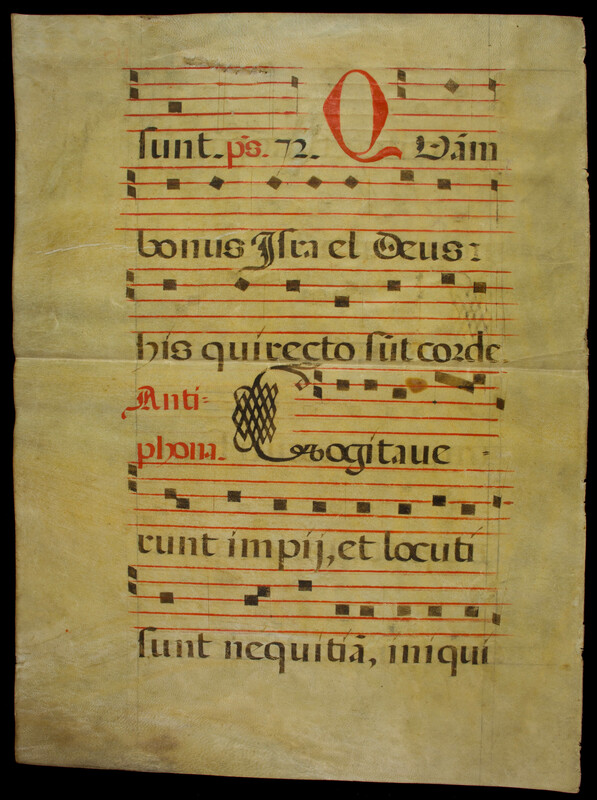 Contents: Large letter cut from a music manuscript. Contents: Excerpts from hymns. 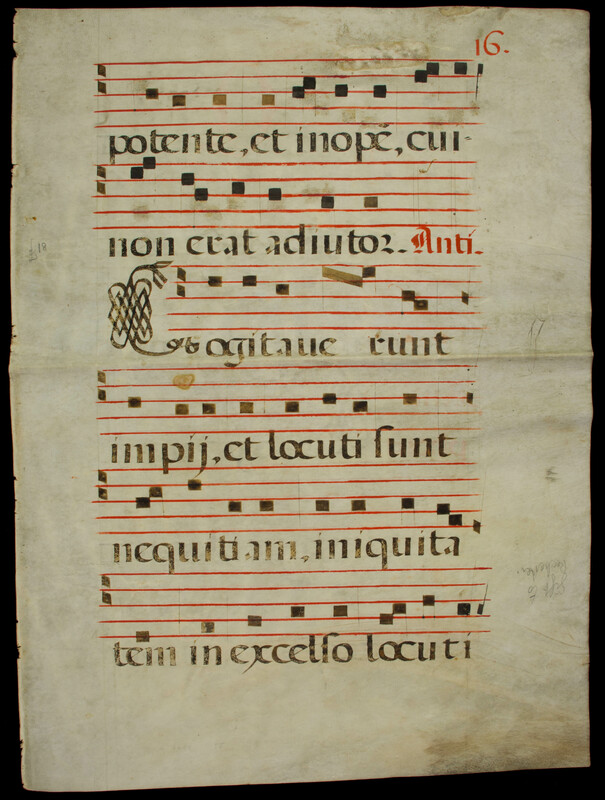 The text is primarily “Cogitaverunt impii et locuti,” a chant in the Graduale Romanum, with excerpts from Psalms 71 and 72. Contents: Religious document. The document has a difficult cursive script that has faded with age. It is primarily in German, but uses a number of Latin words and phrases. Contents: Leaf with text of Joshua 19-21. 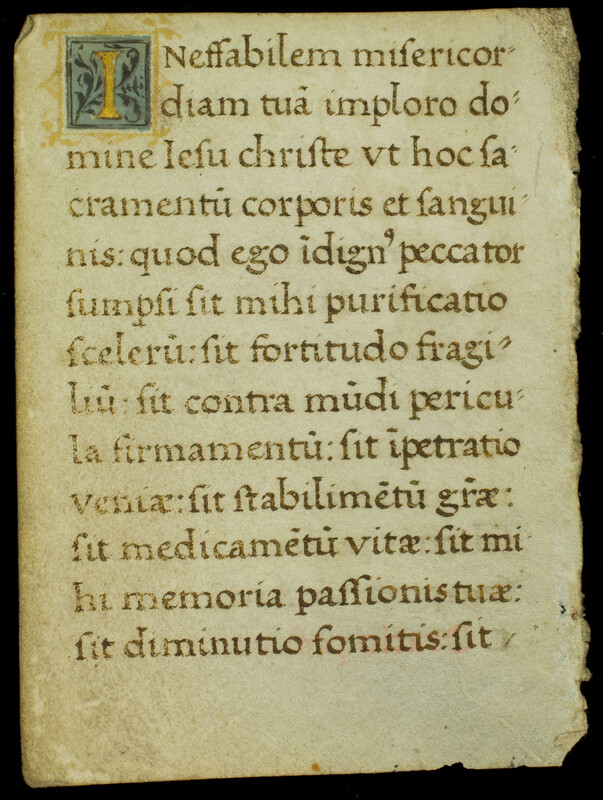 Contents: Excerpt from Book I of Cicero’s De Oratore. Contents: Grant of house and garden at Marseilles to Guillermus de Peliciis. Contents: Excerpt from a Persian manuscript containing biographies of noted Sufis and distinguished men. The author is given as Abd-al-Rahman, son of Achmad-al-Jami. Contents: Excerpt from the Qur’an, chapter 20. Contents: Henri II refunds a tax to Estienne Gaillard. Contents: Document recording sale of land by Robert Michel to Thomas Johnson. Contents: All of the handwriting is difficult to make out. Thirty-two lines of text with two signatures at end of document. Date taken from note on fold. Contents: Four stanzas of Zipoli’s poem, Malmantile Racquistato. “Perlone Zipoli” is an anagram pseudonym for Lorenzo Lippi (1606-65), an Italian artist and poet. Lippi began the work in 1646 and finished it in 1665, but it was not published until 1688. The Foliophiles suggest this manuscript copy may be Lippi’s autograph text, and I have dated it accordingly. Contents: Ashmead’s will. 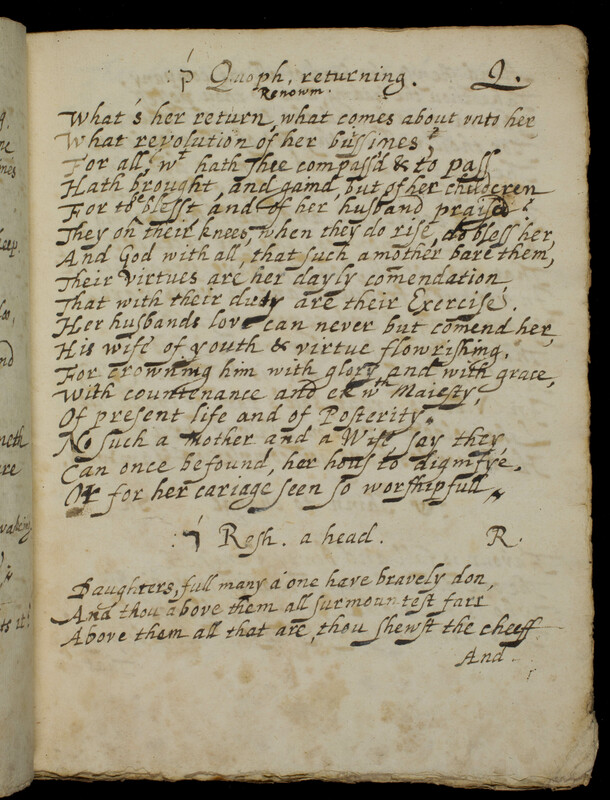 Witnessed by Thomas Ashmead, John Ashmead, and Thomas Browne. No signatures or signatory marks apparent. Contents: Receipt for sale of land. 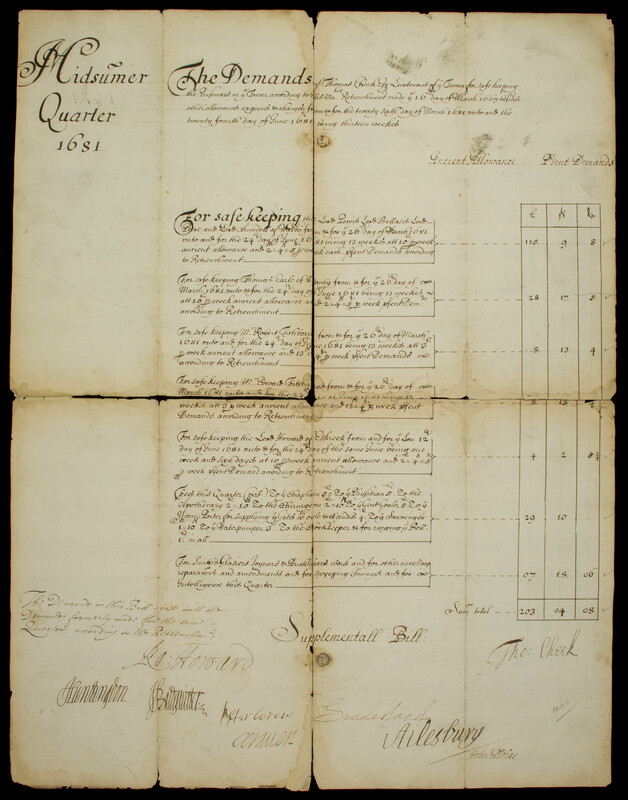 Contents: Agreement between Caton and William Richards regarding lease of land. Contents: Agreement between Rawlins and Edward Ellis. Contents: Leaf with text of Genesis 14:8-16:11. Immediate Source of Acquisition: unknown. Contents: Part of “Obsecro te,” a very popular prayer in books of hours, from which this leaf is likely taken. 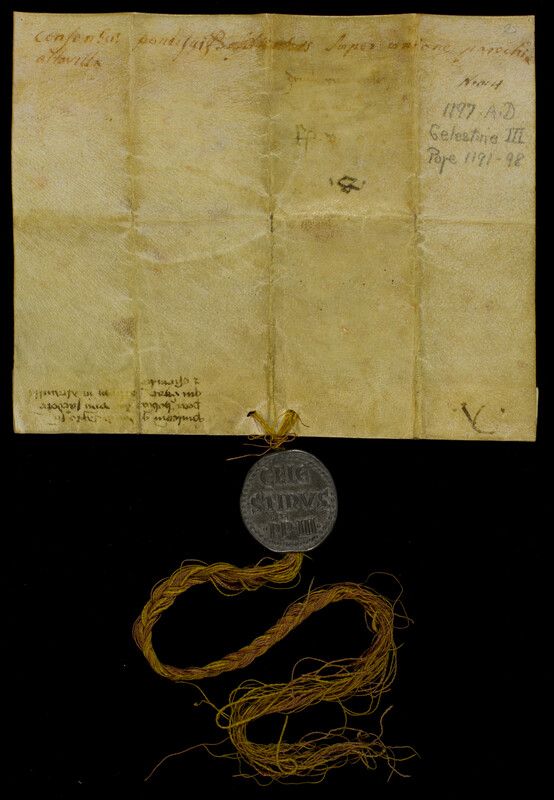 Contents: Leaf with text of John 18:19-22. This leaf is likely from a book of hours. Contents: Bill of sale and transfer of title to real estate and property from Jacobus to Broctius. 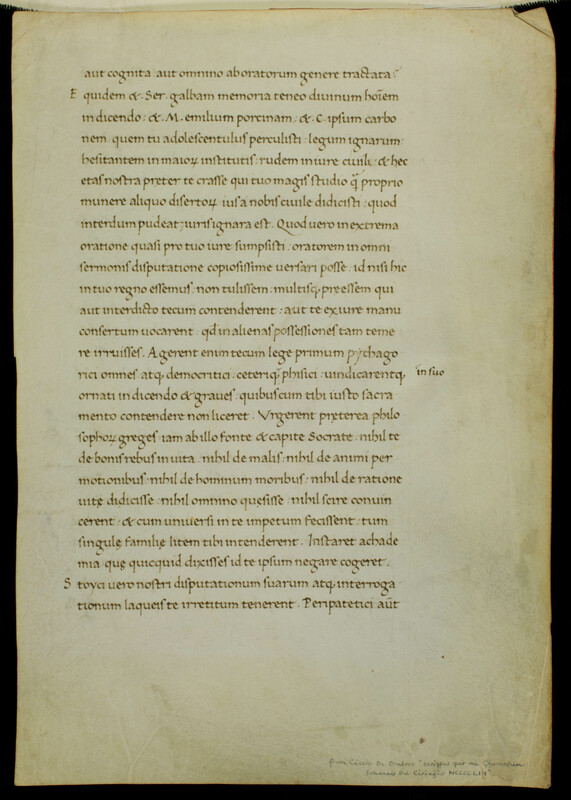 Contents: Inventory of the library at the monastery of St. Victor de Marseille. Contents: German translation of the Stimulis Amoris (the German title translates to The Thorn of Love). Includes a unique woodcut pasted in front cover, dated to 1420-30. 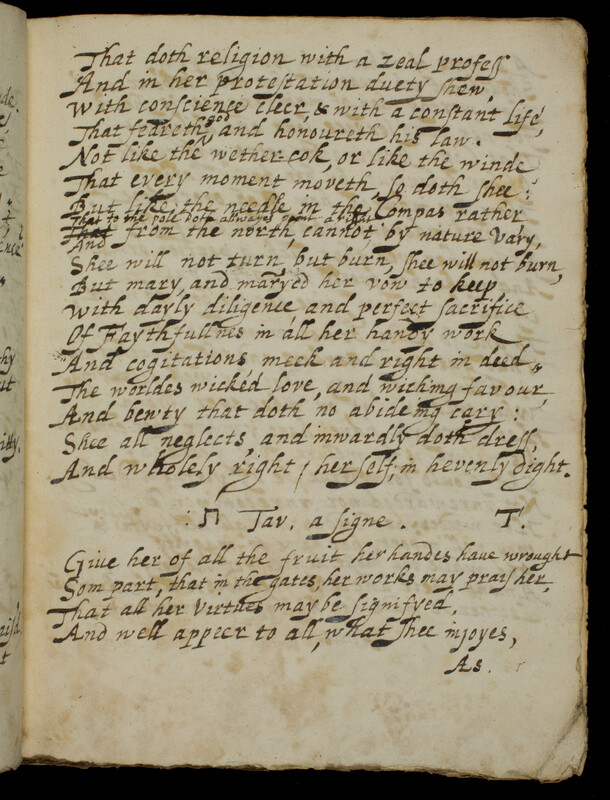 Klapper prepared an edition of the text that includes this manuscript’s variant readings. Contents: The service for the order of extreme unction. Contents: Legal document granting the family rights from the king. Contents: The Rosslau court clerk, Johann Werner Vogelsag, writes to the Woodturners’ Guild at Wittenberg, giving a certificate of good conduct to Johann George Schwartze, who is going to Wittenberg. Document also bears the seal of the town of Rosslau. Appendix of Adjacent Materials: The materials listed in this appendix include items that overlap with the scope of this project. Some exceed the date of this project; others are potentially from the period, but their date is not confirmed. All have been described and assigned a call number prior to this project, and as such, need no secondary listing here. I have included a brief note describing each item. CX 15: Owen, Athelstan. 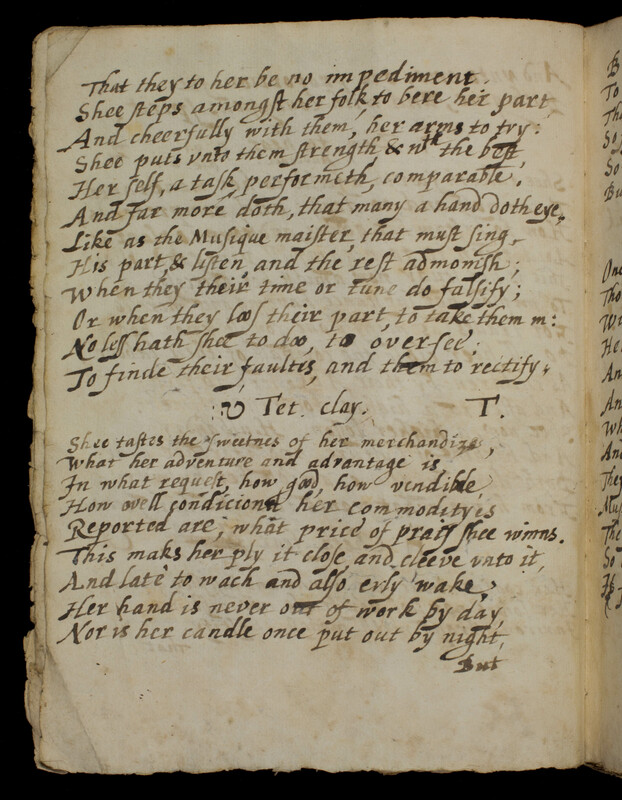 (1693) A collection of poems written and signed by British poet Athelstan Owen (1676-1731) in a bound journal. CX 98: Nuremberg Lineage Books. (Five volumes, 1628-34) This is a collection of genealogical information, accompanied by drawings of coats-of-arms, printed material, and engravings of notable citizens of and places in Nuremberg, Germany. CX 99-103: Venetian Lineage Books. (Five volumes, 1692-1780) Manuscript compilations of information about the noble families of Venice, Italy, including drawings of coats-of-arms. Different compilers created each volume. CX 189: St. John Chrysostom. (c. 1450) Latin translation of sermons of St. John Chrysostom (347-407 AD), archbishop of Constantinople. CY 28: Transcripts of Anglo-Saxon Charters. (c. 1650) Transcripts of twenty-nine Latin and Old English charters, primarily grants of land and privileges to the church at Worcester. CY 40-41: Venetian Books of Arms. (Two volumes, 1692-1780) Manuscript compilations of information about the coats-of-arms of various noble families of Venice, Italy. Different compilers created each volume. D.29: Anne (St. John) Lee Wilmot, Countess of Rochester Papers. 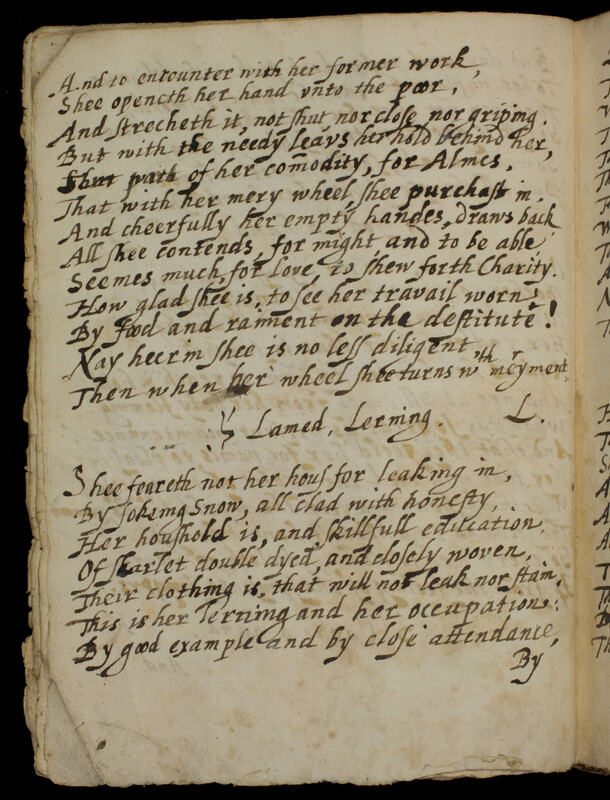 (1685-86) A collection of sixteen letters written by the countess to various family members mainly regarding the disputed will of Anne (Lee) Wharton. Albani, Joseph. These two items, both dated 1794, were part of the Italian Documents collection donated by Alexander Karp. Luther, Martin. This description and explanation of the significance of Luther’s seal is, according to Robert F. Metzdorf, a late eighteenth-century quotation from a letter, and not a contemporary copy. Mordaunt, Charles, Third Earl of Peterborough. Although Mordaunt lived from 1658-1735, this item is not included because it is just his signature, devoid of any greater context, and quite likely from the eighteenth century. The source of the item is the R. B. Adam Library, and the sole entry in the Adam catalog for Mordaunt describes that piece as “A.L.S. September 25, 1707. 1 p. 4to” (s.v. “Peterborough (Charles Mordaunt, Third Earl of),” vol. 3, p. 195). Queen Anne. This item is a copy of eleven letters from Anne (1665-1714) to Sir Charles Hedges, one of her secretaries of state, primarily regarding stays of execution. Since Anne ruled 1702-14, these royal letters postdate this handlist. 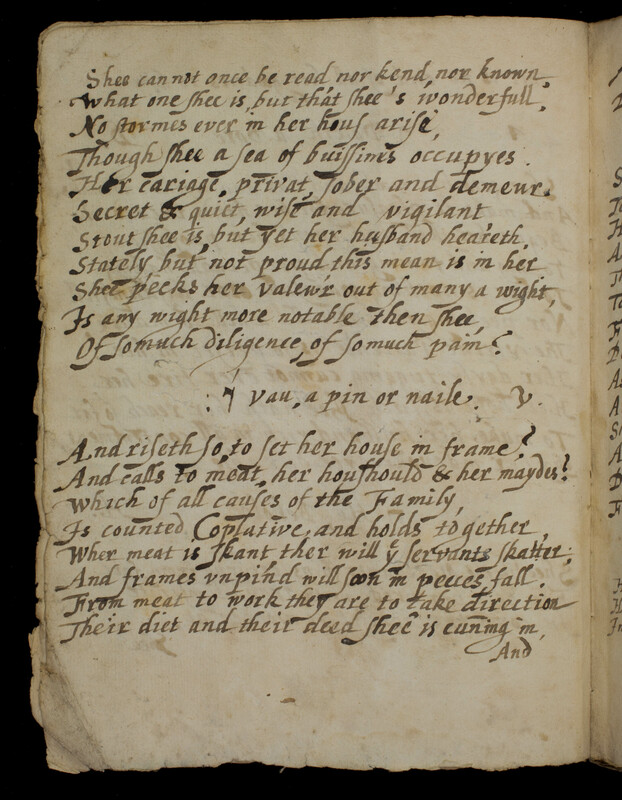 Beatrice Curtis Brown offers an edition of four of the letters (taken from an earlier publication) and notes “they must have been written before December 1706, when Hedges left office” (p. 117n1). One letter mentions the capture of Valencia, Spain; Charles Mordaunt, earl of Peterborough, took Valencia on January 24, 1706, suggesting the original letters were written in 1705-06, and these copies were likely made late in 1706 or in 1707.